Still others seek a perspective you can't get from dry land. RI VER ROWI NG ASSOCI ATI ON, I NC. 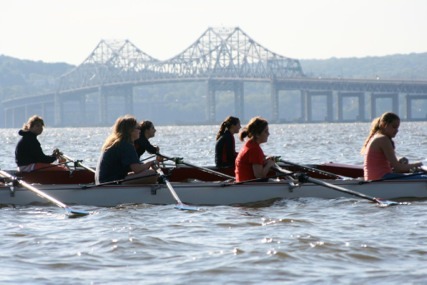 The River Rowing Association of Nyack, NY invites you to join in the challenge: a 25 kilometer race from the Tappan Zee Bridge to the George Washington Bridge along the mighty Hudson River. This year’s course will reverse our upriver race from last year. There will be racks set up to store rowing shells and kayaks. If you have your own portable racks, please bring them as there will be room to set them up in the park. Due to the potentially difficult conditions and the length of the race only experienced crews are invited to compete. Although there will be chase boats, crews will largely be on their own and safety will depend on the safe, orderly, sportsmanlike conduct of rowers. All craft will be required to carry life preservers, bailing equipment and a cell phone in waterproof container. All boats will be checked for this equipment prior to launch.